Pittsfield, NH native Willard Knight Cobb enlisted on 23 Aug 1861 and was mustered in on 18 Sept '61, as private in Co E, 4th New Hampshire Infantry. He was promoted to sergeant on 1 Nov 1863. During the Battle of Chapin's Farm (Newmarket Heights), VA on 29 Sept 1864, he was killed in action. 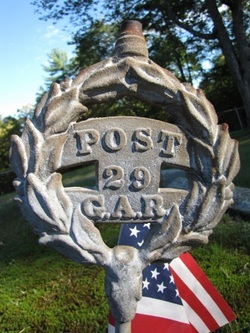 Shown are two versions of the GAR markers used by the Cobb Post.